For his third inauguration, Governor Andrew Cuomo did not choose a simple ceremony at the state Capitol, like he did in 2011, or the steel and glass of One World Trade Center, where he was sworn in for a second term four years later. This time around, Cuomo opted for Ellis Island—one of the most iconic symbols of American multiculturalism. 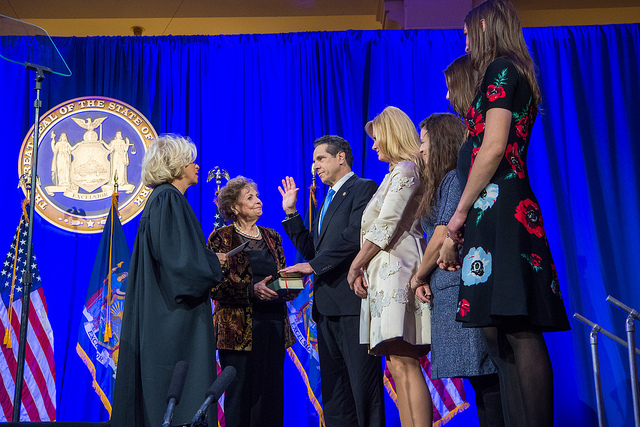 The three-term governor—who spoke after Attorney General Letitia James, Lieutenant Governor Kathy Hochul, and state Comptroller Tom DiNapoli were also sworn in—made his inaugural speech more about national rather than state issues, especially in how it relates to Trump. Whether Cuomo honors a campaign pledge to not run for president in 2020, his willingness to make good on the “most progressive agenda this state has ever seen, period” could determine not only his own future political fortunes but also the success of the state Democratic Party, which now has its strongest hold on state government in decades. Here are some takeaways from Cuomo’s address. Cuomo was not alone in presenting himself as a counterbalance to the federal government. James—who became the first African-American New York state attorney general and the first woman elected to the post—also hinted at who she saw as the source of growing intolerance without explicitly naming Trump. “The rights and dignities of everyday people are being trampled by the most powerful among us,” James said. While she made opposition to Trump a part of her winning campaign for attorney general, she could be limited in how she acts upon it, especially following concerns that pursuing a “personal vendetta” against the president could influence the outcome of numerous lawsuits against him. While Cuomo does not face such a limit, he limited his mention of the name “Trump” by noting in his speech, with just a hint of irony, that a German migrant named Friedrich Trump could not have possibly imagined when he passed through Ellis Island that his new country would one day elect his a grandson as president. The mention of Trump’s nationality could also be interpreted as a minor dig at the president, who has incorrectly asserted in the past that Friedrich Trump came from Sweden. Seven giant screens came alive with Cuomo’s words before he ever took the stage on January 1. Whether it was Congresswoman Nita Lowey, former New York City Mayor David Dinkins, former Congressman Charlie Rangel, or his own father former Governor Mario Cuomo, the suggestion was clear: Andrew Cuomo has not changed over the last 20 years. The video was vintage Cuomo, with clips showing him speaking on issues such as homelessness, criminal justice reform and more recent efforts to provide free college tuition for the middle class. Whether it was as the US secretary of housing and urban development, state attorney general or governor, Cuomo has taken on the big issues even they were not easy or popular—or so the video would have you believe. Whether or not all of its claims were true, the six-minute video offered a glimpse of Cuomo as he would like to be seen in 2019: a progressive champion who will do what it takes to promote social and economic equality. For a governor who came into office eight years ago by promoting an image as a fiscally-minded centrist, the change was dramatic—though the video would suggest otherwise. Despite ongoing speculation about his 2020 plans, Cuomo has appeared to paint himself in a corner politically. He vowed during his reelection campaign that only death itself would stop him from finishing his third term as governor. But he is not the first politician to promise he would not run for president and would likely have some political cover if he violated his vow—especially if fellow New Yorker Senator Kirsten Gillibrand ultimately throws her hat in the ring. At age 61, Cuomo is a little older than his father was when he entertained a run for president. The potential candidacies of US Senator Bernie Sanders and former Vice President Joe Biden suggest that there is more acceptance now of older people running for president, compared to the past. Even if he does not run in 2020, Andrew Cuomo could have another opportunity to run for president after his third term as governor. The upcoming Democratic primary is wide open and more than a dozen candidates could enter the race. Donald Trump could still make a formidable opponent considering that he has raised more than $100 million for his reelection, assuming that he weathers numerous ongoing scandals and investigations. Cuomo demonstrated in his own reelection how a politician can leverage a large war chest to overcome political scandal to win another term. If the Democratic primary begins to look too tough, Cuomo might decide that it’s not worth the trouble if he could run at a more opportune time. Cuomo might have promised last year that he would not run for president in 2020, but he has never said that he categorically would not pursue higher office. The Democratic field might be less competitive in later elections—especially if Cuomo is able to distance himself from the Buffalo Billion and Crystal Run scandals from 2018. A successful third term as governor could be what he would need to make that happen. Zach Williams is a staff reporter at City & State and its sister publication, New York Nonprofit Media.